The Oakland Athletics announced today that they have claimed outfielder Alex Hassan off waivers. The 26-year-old Hassan had made his major league debut with the Red Sox in June, during his sixth year with the organization. Hassan is the second player in less than a week depart Boston for the A's: catcher Carson Blair was signed as a minor league free agent, per Matt Eddy of Baseball America. Hassan, a product of Milton, Massachusetts and BC High School, was originally taken by the Red Sox in the 20th round of the 2009 draft out of Duke. As he made his way through the system, he gained notoriety for his keen batting eye. With Portland in 2011, he walked 76 times on top of a .291 batting average, compiling a stellar .404 on-base percentage and garnering Eastern League All-Star recognition. Following a solid 2012 campaign with Pawtucket, the Red Sox added Hassan to the 40-man roster, but a stress fracture in his left foot delayed the start of his 2013 campaign. After a long stint in extended spring training and brief rehab stopover in Greenville, Hassan returned to Pawtucket in June to play some of the best baseball of his career, hitting an excellent .321/.431/.460 in 55 games. Back with the PawSox to kick off 2014, he struggled to a .217/.318/.303 in the first two month, but he received his first call to the majors when the injury bug hit the major league outfield. 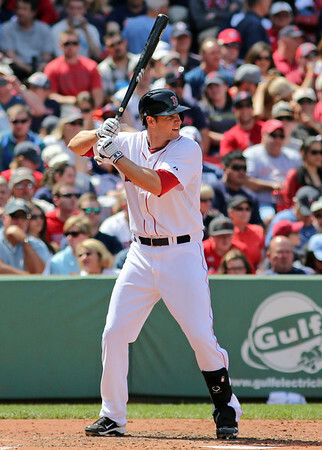 He made his major league debut on June 1, delivering his first major league hit and adding a walk and run scored. He appeared in only two major league games, but the recall was a turning point in his season. After returning to Pawtucket, Hassan hit 327/.411/.498 in 298 plate appearances, adding 29 extra-base hits. Despite his strong close to the season, Hassan was not recalled when the rosters expanded in September. With 40-man roster space at a premium, the Red Sox tried to slide the former Blue Devil through waivers. Oakland, long-known for an organizational approach that emphasizes plate discipline and working deep counts, pounced when the patient Hassan became available. Hassan will be joined out west by Blair, another minor league veteran with a patient approach. Given a $200,000 bonus after he was drafted in the 35th round out of Liberty Christian (TX) High School, Blair showed flashes of power throughout his minor league career but struggled with the strikeout. These tendencies were magnified in 2014, as Blair had 39 extra-base hits and 11 home runs, to go with 58 walks in 298 at-bats between Salem and Portland, but he also struck out 107 times.